One of my readers (Peg!) asked me if Penny and Ice were the same dog. She went on to point out that since most of the dogs have stage names it can be a little confusing trying to keep everyone apart. I realized immediately that SHE WAS RIGHT!!!! So the first thing I did was fire off an answer to her that "No", Penny and Ice are not the same dog. They are both Kona's sisters, but Ice is his littermate. Kona and Ice are from a repeat breeding of Penny's litter. The breeder liked Penny's litter so much that she repeated the breeding and got another nice working litter. 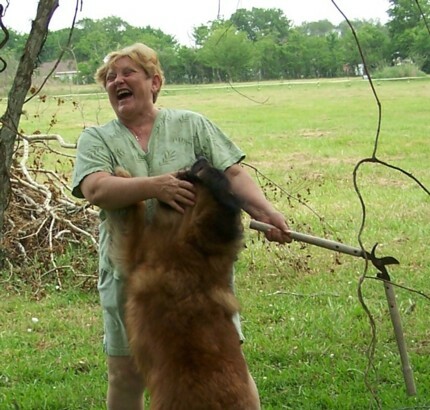 My mother had three old dogs die within a year apart, leaving her dog-less (shudder! ), so Kona's breeder sent her Penny. Penny's owner had died and Penny needed a loving home. It was a match made in Heaven. I also put some thought into the problem that many newer readers probably need a playlist to figure out our Cast Of Characters, it would help if I actually gave readers a "Cast of Characters!" So I did! In the About Us sections I just included photos and names. I'll add to it later, but I hit the main cast. Go have a peek and let me know what you think! Oh dear . . . Deb just wrote to inform me that I needed to add the horses to our Cast Of Characters. I'll start adding them . . . Nothing like the love of a good dog. I'm glad your mom and Penny have each other. Okie Dokie! Thanks Jan for pointing that out to me! Somehow it slipped right past me! (not hard to do!) Send me a picture of your Trace!